1 We are Hokkaido Consadole Sapporo !!! We are Hokkaido Consadole Sapporo !!! 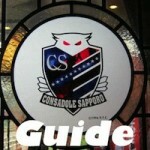 “Hokkaido Consadole Sapporo” is professional football club, and belong to Japan profeesional Football League (J-League). Consadole was born at 1996. Consadole is at Sapporo City (Hokkaido prefecutre) where is in the north of Japan, formerly opened Winter Olympic Games in 1972. The club name of “Consadole” is made from ‘consado’ as reverse of Japanese word DO-SA-N-KO (means people of Hokkaido) and ‘Ole’ (shout word of Latin). This club name is with all Hokkaido citizen’s heart that Consadole is our club. Steering Company: Consadole Co., Ltd.